I had a Ken Griffey Jr. poster on my wall when I was in middle school. 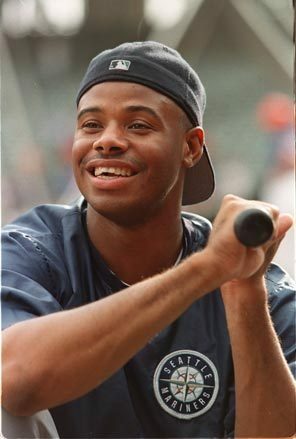 His rookie, maybe sophomore year, Sports Illustrated released a bunch of posters of him, each showing Griffey at the end of his swing, one of the sweetest in baseball history, tracing the invisible ball’s trajectory. Griffey was a delight to watch. His hat backwards, his smile, his gregariousness permeating his on- and off-field interactions, his nickname, “The Kid,” the perfect moniker encapsulating how he made sportswriters and fans feel when they watched him play. Of course, I was a kid, so he didn’t make me feel nostalgic or all waxy-poetic, but he was a favorite. Even in New York in the early ‘90s, where Seattle games weren’t on any kind of news reports. And then, of course, the business of the game screwed it up. Contract negotiations, expectations in Cincinnati, and injuries often drained that fun-loving grin away from him, like so many victims of the Skeksies’ soul-sucking crystal. And now that I’m comfortably in my mid-30s, I know what all those sportswriters and older fans felt when Griffey broke on the scene. Mike Trout, who deserves more than any of these barely-legal wunderkinds to inherit that mantle “The Kid,” is making me remember the unadulterated, innocent game (at least, innocent to me), before scandals and broken idols and money entered a child’s conscience. I really, really want to hang out with Trout. I “liked” his page on Facebook. I get a goofy, star-struck, teen-crush smile on my face whenever I see him rounding third on a homer giving a hard low-five to Angels third base coach Dino Ebel, and his mischievous smile when he enters the dugout and when he looks like Tom Sawyer or Huck Finn during a postgame interview, playfully ribbing one of his teammates, or the other day when he impishly talked about Torii Hunter’s aging legs. It makes my heart light to see this Kid — really, this kid — play with this much abandon and delight. At some point, as crazy as it now seems, Trout will endure a prolonged slump for a couple of weeks or a month, at which point Angels fans (is Orange County capable of bitterness?) will direct vitriol his way, for that high price tag and higher expectations. He may hear his name in trade rumors; there may be a tabloid item; there may be spring training stories of his agent and him not wanting “to talk contracts during the season,” a hamstring injury that he should’ve returned sooner from, a strikeout with the bases loaded in a key postseason game. Even if he does spend a sunny ten-year honeymoon in Anaheim, his early-30s salary negotiations could be acrimonious. He may end up in New York or Philly, the closest cities to his hometown. There could be a ticker-tape homecoming, but when the confetti clears, the expectations will remain. Trout’s levity and “Aw shucks” demeanor (so odd, considering his Millville, New Jersey roots) could give way to steely resolve and refusal to talk to the media. It could cease to be a game to him. There are Kids for every generation. 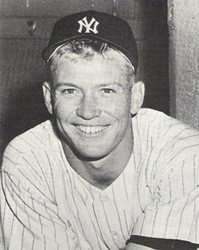 But as Jane Leavey’s remarkable Mickey Mantle biography, The Last Boy, so eloquently shows, they are stand-ins for our own dormant and once-vibrant hopes and aspirations. Living and playing and joking vicariously through through this 21-year-old bright young thing will be betrayed by the passing of time; when Trout, like Griffey and Mantle before him, has his smile beaten down into a workman like grimace, we’ll all be reminded of mortgages and childcare and car payments and that leak that needs to get repaired and the fading sunshine of our endless youth.